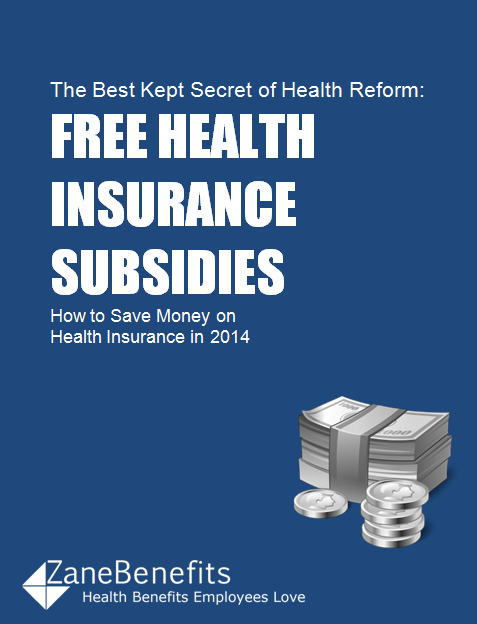 Zane Benefits, the #1 online small business health benefits solution, announced today the publication of a free eBook "The Best Kept Secret of Health Reform - Free Health Insurance Subsidies." The new eBook helps employees, HR managers, and business owners understand how to save on the cost of health benefits with the individual health insurance subsidies and defined contribution. According to Zane Benefits, the best kept secret of the Affordable Care Act (aka Health Reform or ObamaCare) are the health insurance subsidies which will be available to the majority of employees starting January 1, 2014. The federal government is providing free money to employees to lower their annual health insurance expenses. Businesses can take advantage of these savings with a "pure" defined contribution approach to health benefits. Employees, HR managers, and CEOs should download this guide for a concise overview of how to take advantage of the discounts.